When the Los Angeles Lakers stunned the world last year by trading for Steve Nash on the 4th of July and then trading for Dwight Howard about a month later, they instantly became the favorites (in most NBA fans' eyes) to win the Western Conference. Now, with the midway point of the season right around the corner, the Purple & Gold find themselves 4 games below .500, currently sitting in 11th place in the West. At this point, instead of discussing whether they'll reach the NBA Finals or not, fans are wondering if the Lakers will even earn a playoff spot. So what's wrong with the Lake Show? For starters, the Lakers are ranked 26th in points allowed per game. Their defense has been atrocious all season long. They are giving up a whopping 100.8 PPG. Even with defensive minded coach Mike Brown, Los Angeles started the season off horribly at 1-4. By canning Brown and bringing in Mike D'Antoni, an offensive specialist, they couldn't have possibly expected to get better on the defensive side of the ball, right? Throw in the fact that the roster was not suited for D'Antoni's trademark run 'n gun offense, and it's obvious the organization made the wrong coaching hire. With the exceptions of Howard and Metta World Peace, there aren't any other great defenders on the roster. Kobe Bryant's reputation as an elite defender is long gone by now. You rarely see him guard the opposing team's best player anymore. He fails to switch on screens often, and he just doesn't have the foot speed to keep up with younger, faster players. Bryant focuses more of his energy on the offensive side. I'm sure KB24 still has it in him to lock down an opposing player, but he chooses not to for the sake of saving his legs for scoring purposes. Steve Nash was never known as a great defender. Pau Gasol has shown flashes of brilliance on defense, but he is way too inconsistent to be placed in the elite category. And nobody on the bench stands out as a strong defensive minded player, either. Another major concern for the Lakers is their turnovers. They are ranked 27th in that category. Kobe and Dwight are both in the top 10 in terms of turnovers per game. Both have been known for turning the ball over quite a bit over the years. For Bryant, it's usually a case of trying to do too much. And for Howard, it's a combination of committing offensive fouls and not giving up the ball when being double teamed. Bench play has also been a weak spot, with a ranking of 28th in the league. 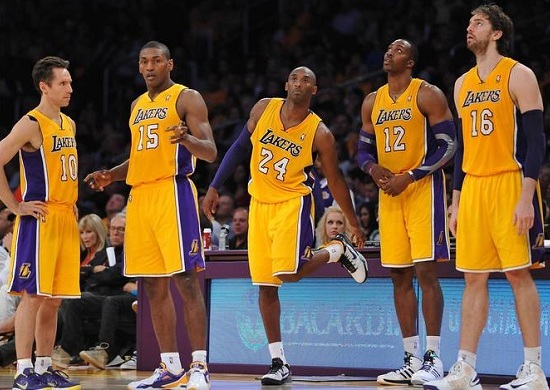 Jodie Meeks and Jordan Hill have been the only players contributing on a daily basis. That will not cut it for the Lakers. Antawn Jamison needs to see more minutes and somebody else needs to step up and take some of the load off the starters. Better bench play means the superstars don't have to do so much, and hence, reduces turnovers. Contrary to the troubling flaws, the Lakers have had success in other areas. They are top 5 in the league in points scored per game and rebounds per game. They are a very good offensive rebounding team, but the problem is, they allow too many offensive rebounds as well. Individually, Kobe is having a tremendous season, one of the best of his career. He's shooting a career-high 48% from the field, leading the NBA in scoring again (30.2 PPG), averaging 5.2 rebounds and 4.7 assists per game. Despite not being 100% healthy and receiving constant criticism in the media, Dwight finds himself ranked in the top 5 in the NBA for field goal percentage, rebounds, and blocked shots. He's averaging a respectable 17 points and 12 rebounds per game. Nash has averaged 10 assists per game since coming back from injury, and only failed to reach double digits in scoring in one of those games. Metta is having his best season as a Laker this year. His averages in every category are the highest they've been since coming to Los Angeles. On the other hand, Gasol is having quite possibly the worst statistical season of his career. He seems to be the weakest link in the starting lineup thus far. While Pau has consistently tallied a good share of assists by getting his teammates involved, his lack of offensive aggression has hurt the Lakers. It's becoming evident that Pau does not fit in D'Antoni's system, but the bottom line is, he is way too talented to not be scoring the ball more. As we have grown accustom to over the last couple years, the Gasol trade rumors continue to linger, and Pau's inconsistent play has only fueled the fire more this season. Should the Lakers trade him? Unless they can somehow land Kevin Love, I don't think it'd be smart to ship out the 7-footer just yet. Dwight Howard is not guaranteed to be on the roster next year. If he decides to walk, I'm sure the Lakers would love to have the Spaniard at center as a plan B. If Superman signs a long-term deal with Los Angeles, then they can go ahead and really try to work out a deal for Pau in the offseason. And really, it would be pointless to trade Gasol right now anyway, because he Lakers' woes are not getting fixed this season regardless. When the team struggled while Nash was injured, many optimists figured the squad would right the ship once No. 10 got back on the court. And while it seemed it would be that way, as the Lakers won 3 of the first 4 games that Nash returned, all optimism has since went out the window as the team has now dropped 4-straight. It doesn't look to get better anytime soon, either, with games on the road against San Antonio and Oklahoma City coming up. Not to mention, Los Angeles will continue to be without Howard, Gasol, and Hill, as all 3 bigs are suffering from injuries. Nash himself seems to have lost hope. Following Tuesday's loss against Houston, Steve said, "I think a couple of weeks ago people would have thought it will get better. Now, I definitely don't think there's a guarantee it will, so the only remedy is to continue to work hard and give yourself a chance for it to get better. I obviously think with time, and that might mean through the summer, we can get better. But for this season, it's definitely going to be a challenge to turn this around." Not surprisingly so. Reports have since surfaced that Kobe and Dwight had heated exchanges and almost came to blows at one point. Whether it's true or not, it's definitely a conceivable notion. Bryant has always been one to speak his mind and call out his teammates, and Howard has developed a bit of an attitude himself over the last couple years. Everyone knew they would be on thin ice this season if they didn't win right away, and everything that could have possibly gone wrong to this point, has. It's been a living nightmare for Laker fans, and for now, there is no light at the end of the tunnel. They still have time to get on track, but they need to start playing better ASAP. Not particularly a Laker fan, but I'm really surprised to see them struggling the way they are. Surely they'll get things turned around and make the playoffs. Kobe will find a way to get them straight. The greats always do. Team is too loaded to not make the playoffs.